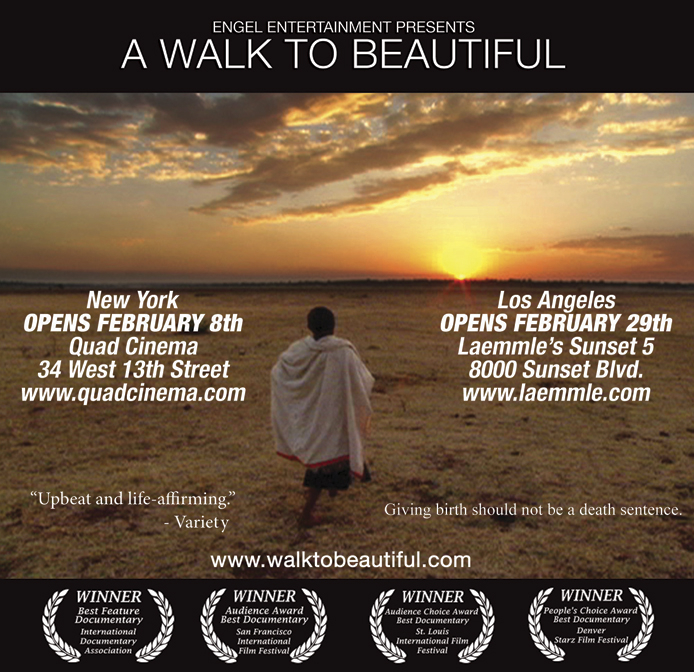 As a Yale graduate working at Engel Entertainment, a non-fiction production company in New York, I am pleased to invite you to see our award-winning documentary, A Walk to Beautiful, on the big screen. A Walk to Beautiful follows five Ethiopian women who suffer from devastating childbirth injuries as they embark on a journey to reclaim their lost dignity. The film won top honors as Best Documentary Film of the Year from the International Documentary Association (besting this year's Academy Award nominees in the process). The film premieres in New York on February 8th at the Quad Cinema (34 West 13th St.) where it will run for at least one week and can hope to have its run extended in response to audience support. On Wednesday February 13th, YAAMNY and Engel Entertainment will cohost a Q&A session with the filmmakers followed by dinner after the 6:15pm screening of A Walk to Beautiful at Quad Cinema.